So…what is My Geek Box Lite? 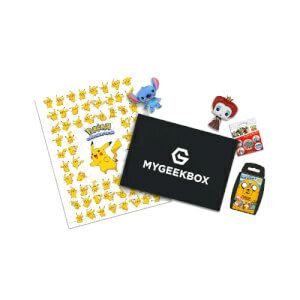 My Geek Box Lite is your monthly shot of all things geeky! This box might be small, but it’s definitely mighty. Get your geek on at an amazing price! Our Lite boxes contain 3 to 4 items, all hand-picked to keep you geeky. Mugs, POP Vinyl, quirky accessories and wearables…it’s a geeky surprise every month! Just like our full sized boxes, our Lite box subscribers get access to exclusive offers! From special offers on geeky gear to vouchers for our shop, you won’t miss a thing. Join our community of geeks from across the globe and get on the road to superfandom! Please Note: This is a subscription box, with payment taken monthly. Upon expiry of your subscription, it will automatically renew for a further fixed term of the same length. Your Geek Box Lite will normally be dispatched at the start of the month, and we'll charge your card when your box is on the way. View FAQs here. That take 1 month to receive it !! BUT it worth !! I love love it ! I think this box will be cool and.....And this I my first time doing this hopefully I get this cool looking box.